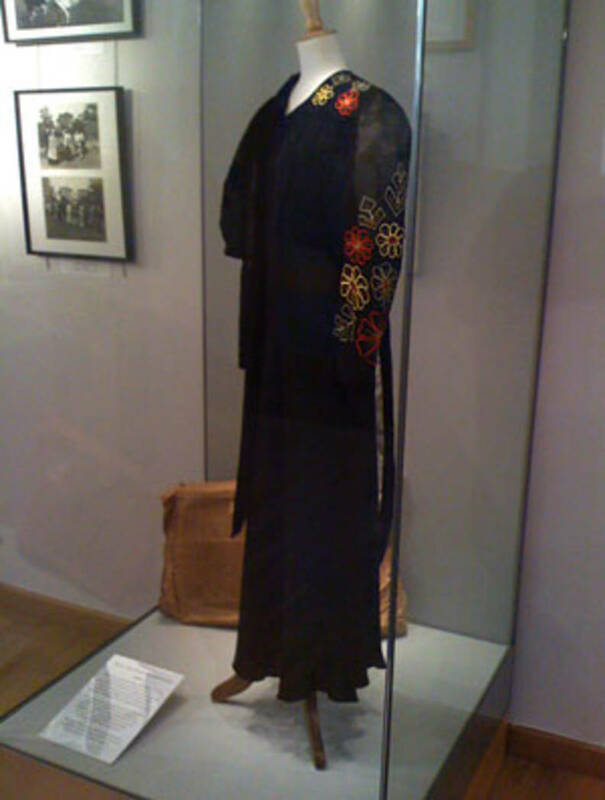 This black crêpe dress and opera coat were made for, and worn by, Mrs Doris Armes to the first dress rehearsal in 1934. John Christie filled the auditorium with his estate workers and employees on these occasions, and Mr Armes worked at the Ringmer Building Works for over 30 years. The dress and coat were made by Madam Mildred of Gardner Street in Brighton. Next to Mrs Armes’ coat and dress is the box the garments were delivered in. The delivery to Mrs Armes was made by the Brighton bus – hence the instructions to leave the parcel at The Green Man in Ringmer for later collection! Mrs Gill Williams, who generously donated the dress to the Archive, believes her mother never wore it again.